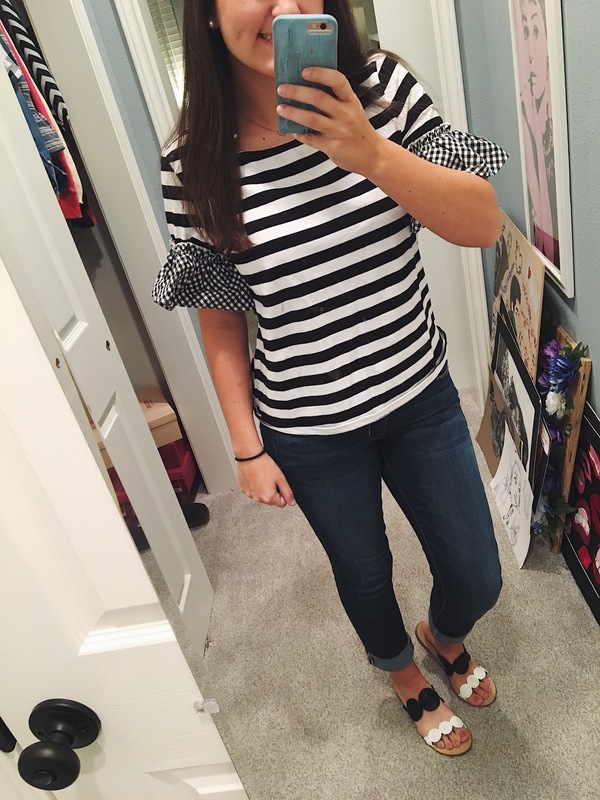 So I just had my first week of senior year and I really enjoyed my outfits that I wore every day! However, I only have three to show y’all since my first week got cut short. Because of hurricane Harvey, most southern Texas school districts have closed and this happened to mine. We haven’t gotten hit by the hurricane, just the tropical storm, but there is just so much rain that the flooding is really bad and is going to keep getting worse. A lot of us had to be evacuated, including my family, and it is pretty intense down here. Thank goodness we have loving church friends that are helping us! But anyways, as a result, school won’t resume for me until next week. UPDATE: we made it home okay! Pray that Harvey will hold off the rest of the rain and let our city begin to recover. People have already lost so much. Blogging and writing have been great distractions so I have quite a few posts in progress for y’all! 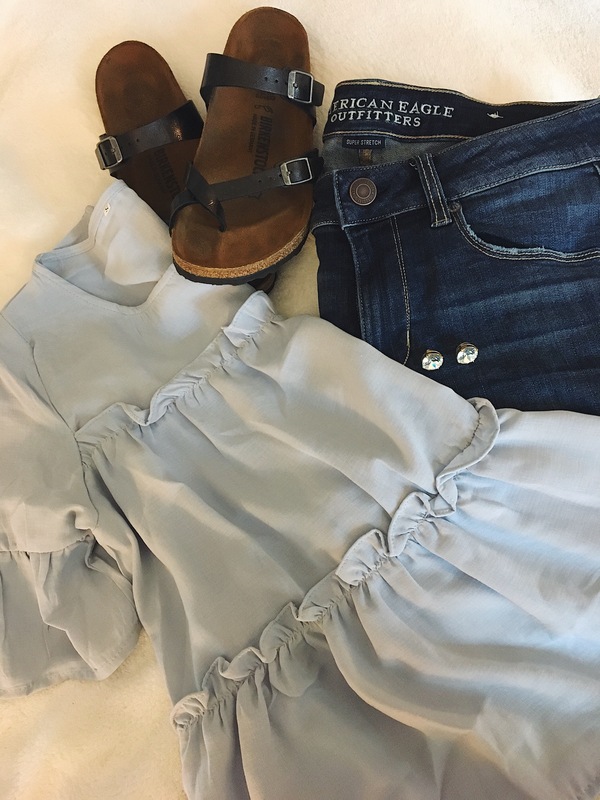 My first day of school outfit consisted of this pretty periwinkle ruffle top from Shein, my favorite jeans from American Eagle and these black criss cross Birkenstocks! 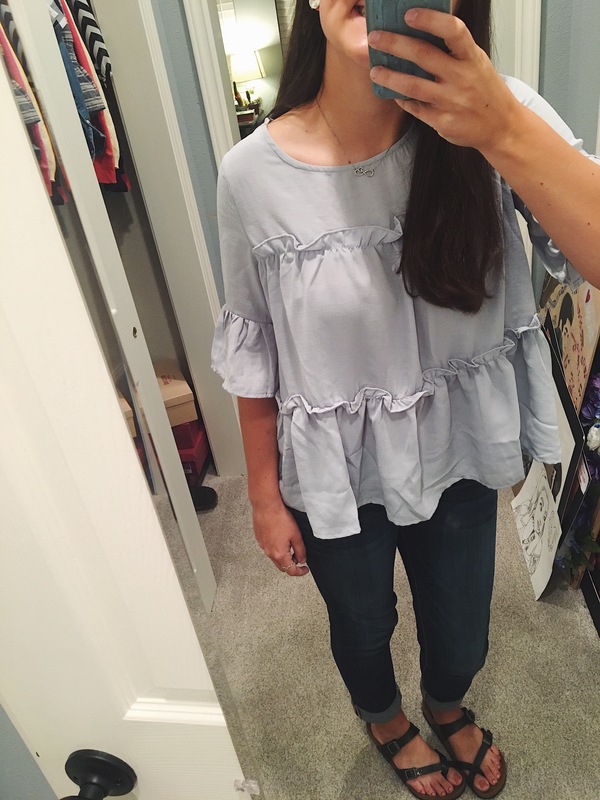 This ruffle top was originally $15 but I got it on sale for $13 during a sale they had on Shein’s website! They say in the description that it is grey, but when it came to my house it was more of a really light periwinkle. My earrings for the day were these darling gem studs from Kate Spade that my boyfriend, Sebastian, got me for Christmas this past year. I love them so much that I even wore them for prom back in May! 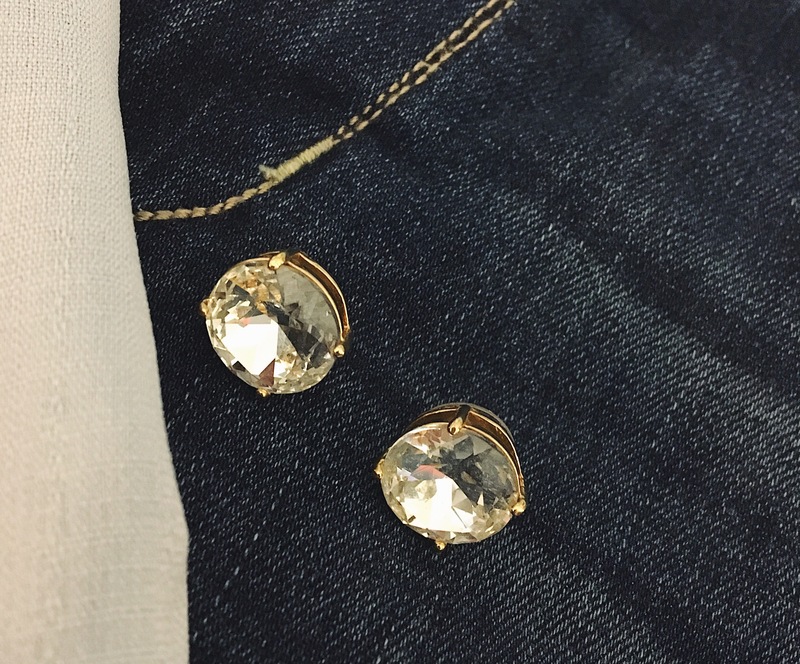 For my earrings I just wore my simple pearl studs. I didn’t get a pic of me in my outfit on Thursday morning because I had a lot going on that day so I was crunched on time! 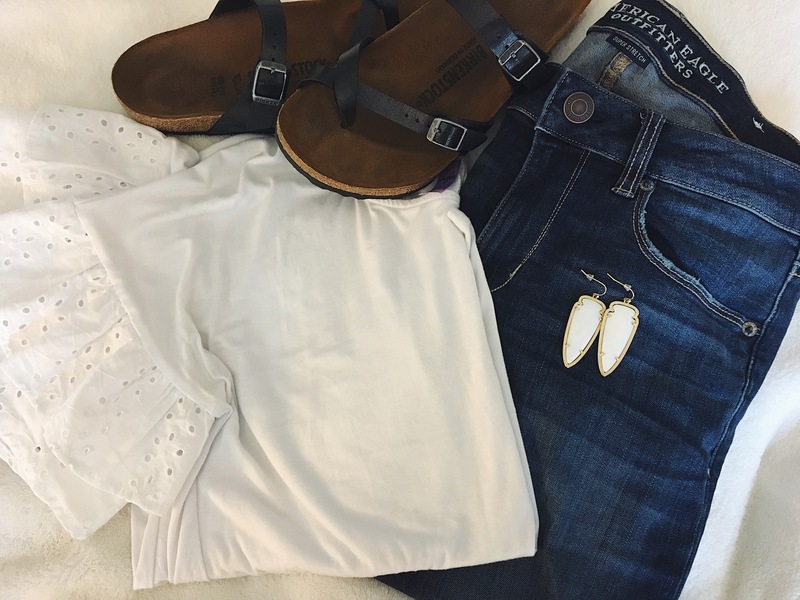 But I wore this super cute white top from Francesca’s, another pair of my fave jeans and then my black Birks again. I also wore my favorite pair of Kendra Scott earrings! As y’all can probably tell, I’m all about the sleeve details right now! P.S. 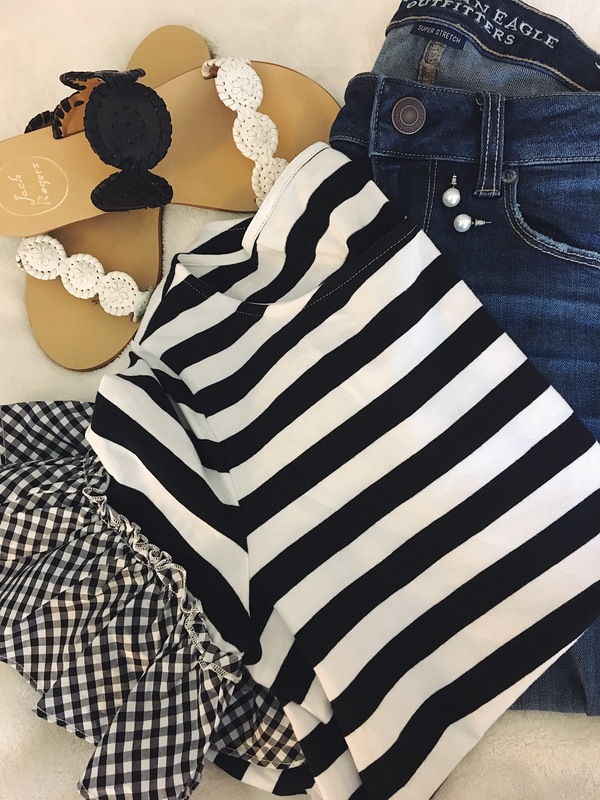 This top is on sale for $20! So that is everything I wore my first week of school! Once school starts up again I’ll try and post my outfits every day. Please pray for everyone in Texas that has been hit by Hurricane Harvey! If you are willing and able, click HERE to donate money to the Red Cross Hurricane Harvey Relief Fund. Anything helps!